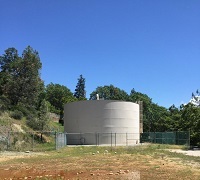 In the summer of 2014, Placer County Water Agency in California was facing a trihalomethane (THM) crisis. THM levels were forming quickly during primary treatment, and THM levels in the clearwell tanks at their Colfax system were particularly high. Under a tight deadline and with limited emergency funds, PCWA wanted to explore how much THM reduction they could achieve with just active mixing and active ventilation alone.